Now Doing Concrete Repairs and Leveling! Vulcan now offers its abilities in a wide selection of cement and concrete restoration as well as no maintenance stone flooring! Broken or cracked concrete driveways? Cracked or sinking basement floors? 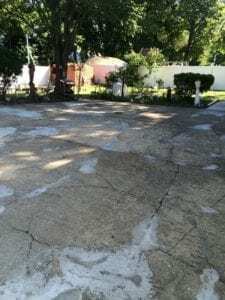 A cracked or sinking concrete patio? The most reliable and experienced basement waterproof contractor can now help you repair these problems. We believe that as the oldest basement waterproofing specialist in the nation our decades of expertise in laying cement makes us taylor-made for the concrete repair industry. This is a natural step for us as we have already been providing professional cement work in basements of more than 750,000 homeowners and businesses for over 60 years. We now offer the same “peace of mind” by offering affordable concrete and cement repair services! We are proud of the reputation we’ve built over the years with homeowners, commercial businesses and builders. Our staff of installers is specifically trained in the art of laying concrete! Let us use our experience and expertise to help improve the condition of your sidewalks, walkways or driveways. Call us now, or click here now to contact us! Get Rid of the Ugly Cracks!